What is a fireplace summer cover or summer door? 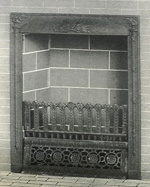 A summer cover was 1 of the 3 components commonly used on small coal fireplaces. The surround served as a frame for the fireplace opening. 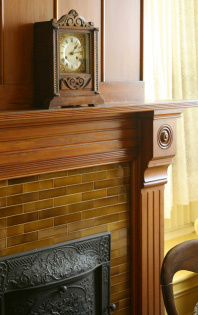 There were usually tabs on the lower portion of the surround onto which the coal grate hung inside of the fireplace. The cover door also mounted onto this surround frame, attaching from the outside. The door was completely removable and was taken off when there was a fire burning. When the fireplace was not in use then the door, or cover, was mounted back onto the frame, keeping warm air from the house from rising up the chimney and in the summer keeping the cooler and often smelly air in the chimney from dropping down into the house. The removable cover door is often missing and we're constantly being asked about replacement covers. As each surround was made by a different company that used their own surround frames, sizes and styles differed greatly, meaning there's no generic size cover available for replacement. It's a bit like looking for a needle in a haystack but if you live in a larger city populated by a lot of late 19th century and early 20th century homes, take careful measurements and check local antique stores as you may be lucky enough to find one to fit. Whenever we have some for sale, you'll see them on our antiques page. Why are the cover doors missing? This is a great tidbit of American history. During World War II the government came through neighborhoods collecting scrap metal to use for the war effort and the covers were often donated to the cause. If your summer cover is missing it's an indication that a sympathetic patriot once lived in your house. How were the frames installed? There were heavy duty wires attached to the back side of the surround and these wires were embedded into the mortar as the fireplace was being built. (Commonly during this era the mortar was then covered over with quarter tiles. )Sometimes these wires have rusted out through the decades but sometimes you practically need to dismantel the fireplace to remove them. 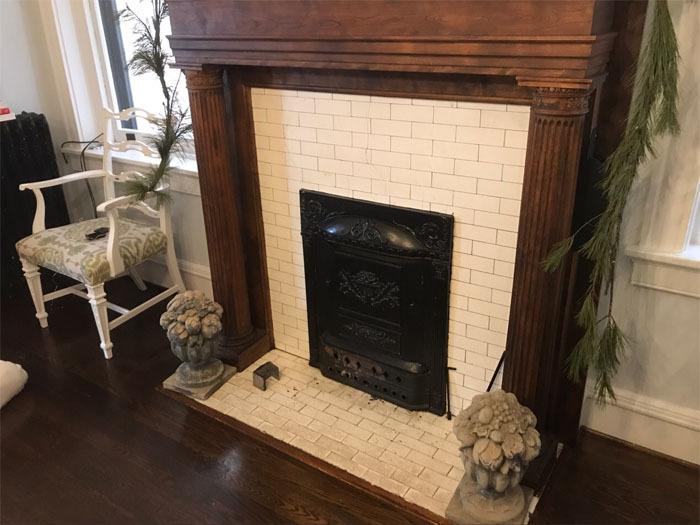 As for reinstalling an antique surround onto a fireplace, we use masonry anchors and/or RTV silicone and attach them to the front face wall of the fireplace. How were the summer covers made? The cover doors were made from a variety of materials. A fair number were heavy, cast iron doors but we frequently see them made of tin and also some in brass. They were always made of a fireproof metal, as it was common to put the cover on when the coals burnt down low so the family didn't wake up to a completely cold house in the morning, by which time the fire had burned out. The design of the cover was most often a bit ornate, and matched the design elements found in the frame.